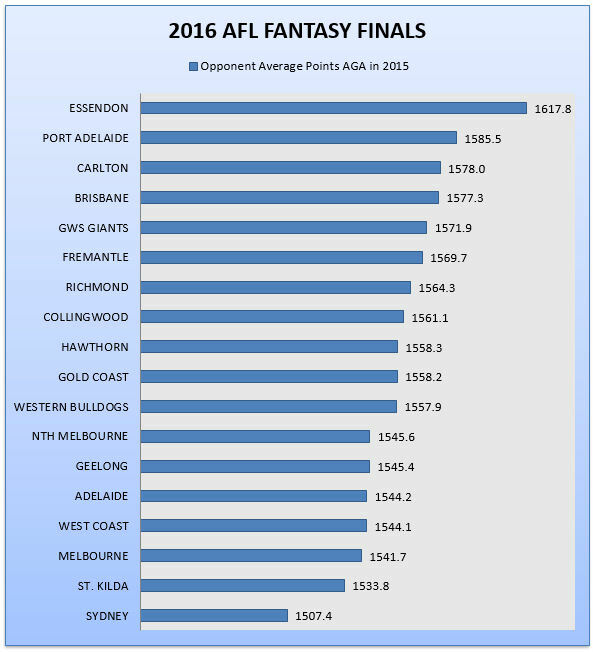 Based on average Team scores from the 2015 AFL Fantasy Season, this is how the 2016 Finals series is shaping up. Believe it or not (Ripley), Essendon have a very good draw for the 2016 AFL Fantasy Finals. The Bombers are lined up to play Geelong in R20 (Ranked 10th in 2015 for Team Points conceded), Gold Coast in Round 21 (Ranked 18th), Western Bulldogs in R22 (Ranked 17th) & Carlton in R23 (Ranked 16th). Sydney have been dealt a difficult final few games of the 2016 season, the Swans are set to play Port Adelaide in R20 (Ranked 3rd in 2015 for Team Points conceded), St Kilda in Round 21 (Ranked 13th), Nth Melbourne in R22 (Ranked 4th) & Richmond in R23 (Ranked 1st). Depending on how your season is going, you may have to consider not taking players in to the AFL Fantasy Finals from the following Teams; R20 Collingwood, R21 Geelong, R22 St Kilda & R23 Sydney. These 4 Teams are to play the No.1 Ranked Team from 2015 conceding just 1448.0 points per game… Richmond! Article provided by aflratings.com.au. Follow Peter on Twitter @aflratings. Not sure. I’ll check with Chad! I assume the deck will commence around Boxing Day??? Might be a bit earlier this year. Haven’t mapped it all out yet, but we will have it! Anyone know when AFL Fantasy returns? I can’t wait! Horrible new about Matty Scharenberg’s injury. He would’ve been an interesting prospect in Fantasy next year.